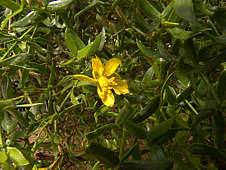 The widespread Family Zygophyllaceae includes 240 species of woody plants and herbs, often resinous, including Larrea tridentata (creosote bush). Genera with succulent species: Augea, Larrea, Zygophyllum. Not commonly grown in collections of succulent plants. This genus includes 5/6 species of aromatic, woody, evergreen shrubs native to the Americas. 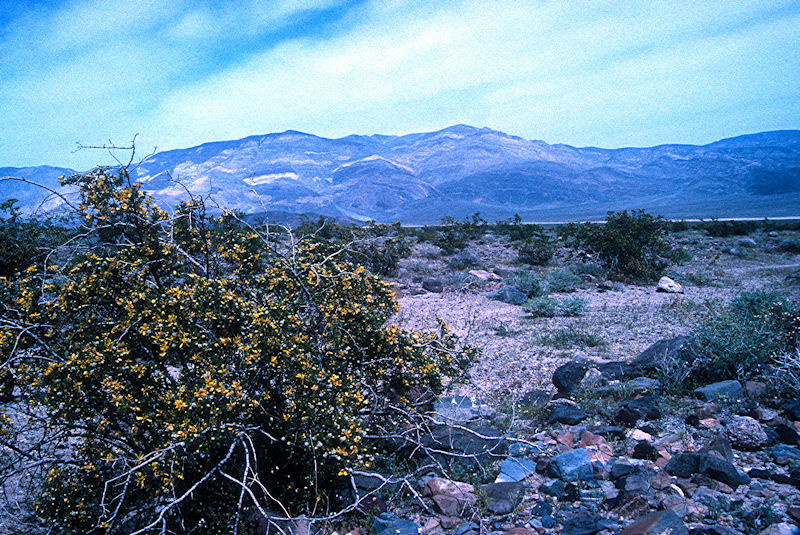 In the warm Southern deserts of North America, Larrea tridentata is one of the dominant plants, especially on soils with a high content of gravel. covers much of the desert of the South-Western North-America from Texas to California, tolerating poor stony ground, salty soils and hot, arid conditions. The xerophytic bushes spread vegetatively and although individual shrubs may die, the clump persists as a genetically-identical population. Some clumps of Larrea tridentata are thought to be thousands of years old. The shrubs often appear to space themselves out as if planted on a regular array, but this is dictated by availability of scarce water. 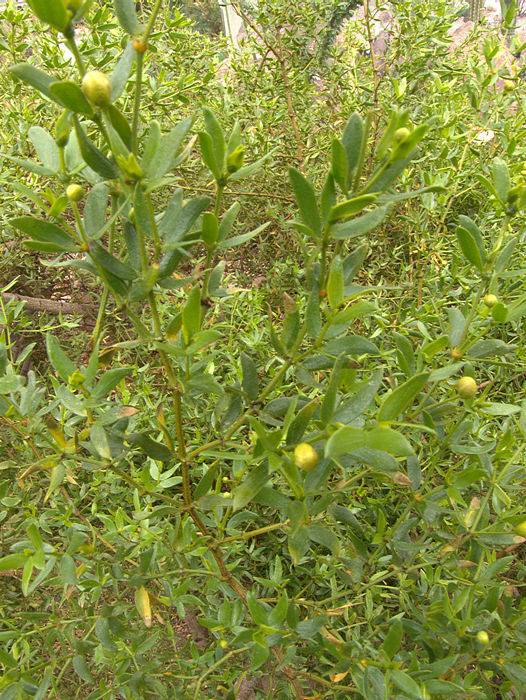 The small golden yellow flowers are followed by a small rounded dehiscent seed pod, splitting to reveal a seed covered in white hairs. 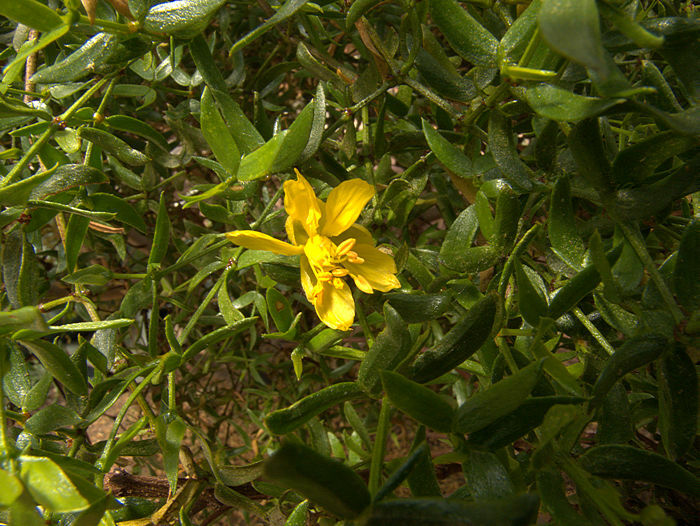 The leaves and stems of the creosote bush are covered with a slightly sticky resinous coating. This resin contains Coumarins which are released from the foliage by water, giving the deserts of the South-Western North-America a characteristic and evocative odour after rain. Substances in the resin inhibit germination of seeds and it is said that nothing will grow under a creosote bush. However, this is not absolutely true. There are often clumps of grass around the base and the shrubs can act as nurse plants for cacti, providing protection from the scorching sun and sand-blasting by gritty particles carried on the wind. In an apparent monoculture of Larrea tridentata, it is often worth looking under the bushes for cacti. Early settlers in North America boiled creosote bushes with water to obtain a tarry substance for preserving wood and sealing barrels.